Take years off your keepsake photos or enhance the current ones with Photoshop CS3's powerful tools and the expert techniques and tips you'll find in this comprehensive guide. Using step-by-step instructions and over 500 pages of full-color examples, this book shows you how to clone, blend layers, add contrast, reduce glare, and more. From portraits to landscapes to architectural masterpieces, fine-tune your favorites with this expert guide. Visit www.wiley.com/go/restoration and download the practice files from the book. You can start with the original images and work through the author's step-by-step instructions in the book. Mark Fitzgerald is a Photoshop teacher and consultant who specializes in helping professional photographers thrive in the digital age. He has taught hundreds of photographers how to smooth out their workflow and get the most from their important images—through private training, classes, and workshops. 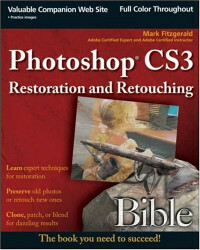 Mark is an Adobe Certified Photoshop Expert and an Adobe Certified Photoshop Instructor. He and his wife Julia (with their two dogs, Ruby and Hazel) live in Portland, Oregon, where Mark owns a consulting business called The Digital Darkroom.